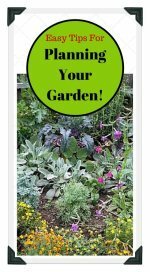 Looking for some easy tips for growing the Asparagus Bean or Chinese Long Bean when backyard vegetable gardening? Learn how simple it is to plant, care for, and harvest Long Beans in your garden! 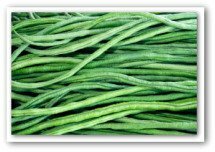 Neither the foliage nor the seed of this Asian pole bean plant resembles green beans, although its uses are similar to the green bean. Their sweet and mild flavor resembles a mixture of asparagus, mushrooms, and beans, or beans and black-eyed peas. 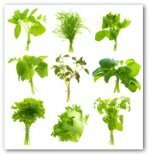 The crop does very well in tropical climates but performs only moderately in cool northern climes. Anyone who has ever bought long beans in the supermarket may have been disappointed because the beans were old and much too large. Plant a few poles of this delicious variety of beans in your vegetable garden; pick the crops fresh, young, and tender and you will be pleasantly surprised at the remarkable taste difference! This bean grows up to 18 inches long. In late May, sow seeds and set up poles for the climbing vines. Pods are ready for harvest in 75 days after seedlings sprout. The mild tasting, sweet stringless pods are excellent in vegetable stir-fry combined with pork or shrimp. Asparagus or Chinese Long beans grow from heirloom seeds and are an open-pollinated, non-hybrid plant. 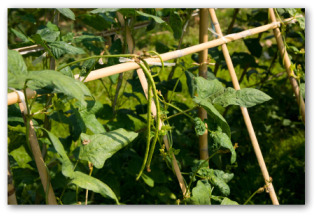 After growing a crop in your vegetable garden, allow a few of the bean pods to mature on the vine. Harvest and save the seeds for the next year. These beans are often called Yard-Long beans and are very easy to grow. 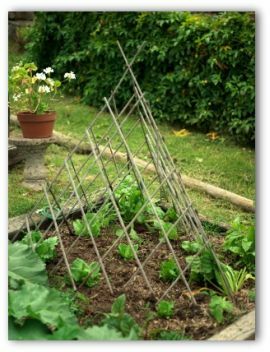 They can be grown successfully using stakes or on trellises. In the springtime, wait until the soil has warmed to a warm 65 degrees before you plant the asparagus variety of bean seeds. Provided with sturdy support, the vines grow quite long, and will double back upon reaching the top. The bean blossoms are pinkish-lavender in color and larger than most other bean flowers. The bean pods grow very rapidly. One day, there will be a small sized dark purple pod string, and a few days later it will have grown up to 18 inches long! So be sure to check your beans every day during growing season. Bark mulch increases bean yields and beans do especially well mulched with oat straw. Beans share vegetable gardening space well with celery, radishes, and staked tomatoes. When the bean crop has grown a half a yard long is the ideal time for harvesting. At harvest time, the slender beans should be about the size of a pencil. If you wish to save your seeds for the following year, permit a few of the ripened pods to stay on the vine until they are dry. These beans are cooked as you would green beans. They can also be blanched and frozen as regular green beans are as well. Their delightful taste and easy growing habits may make them your family's favorite bean from the vegetable garden to the dinner table. Heat wok to medium high. Add 2 Tablespoons oil, and then stir in garlic. Add beans once oil has heated. After a minute or two, add onions and bell peppers. Continue stirring for several minutes. 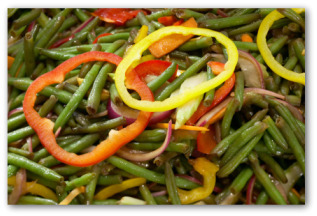 Serve the tender crisp asparagus bean stir-fry immediately.